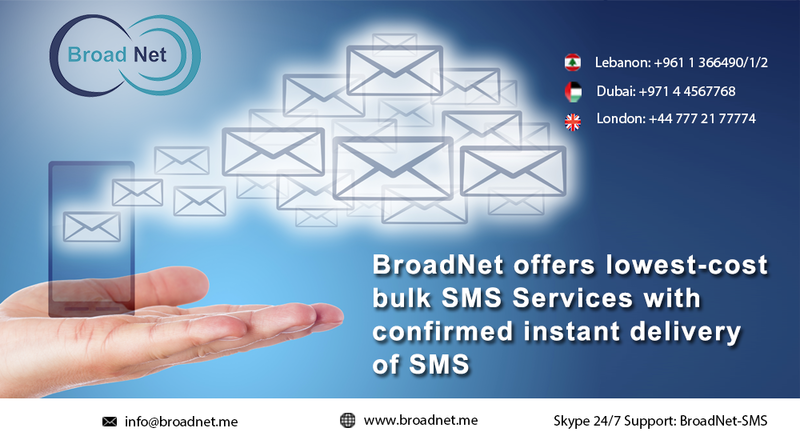 Beirut: BroadNet – a leading technologies company with pinpointed focus in offering standalone, value-oriented telecommunication solutions – is offering low cost bulk SMS services with confirmed instant delivery of SMS. Businesses looking to reach out to their targeted audience quickly, with relatively low or no down time can count on the company’s coverage and expertise. Read on more about BroadNet and how it can help you yield truly vital benefits with favorable business outcomes! SMS marketing is always in-trend given the obvious benefits it offers over other marketing mediums. It is fast, super simple, truly effective, and easily adapts with changing business dynamics. However, many businesses lack the essential know-how to integrate the benefits of SMS marketing. into their marketing funnel. They strive to bring operational excellence with SMS marketing but in the absence of a defined system and trusted platform; they fail to receive the true advantage of their efforts or they stop trying all together. BroadNet understands the evolving challenges today’s businesses face, and thus offers them a flexible, entirely operational and highly sophisticated platform through which the entire process of sending SMS become not only uncomplicated, and effective but also simple and super quick. BroadNet low-cost bulk SMS services . are designed for business of all scales, shapes and sizes. They are flexibly designed and are priced at low note, thereby allowing even startups and small companies avail the benefits. “A global coverage, extensive service spectrum, and a dedicated customer support service make Broadnet our first point of contact for low cost but effective SMS marketing service,” says a happy customer with BroadNet Technologies. To learn how BroadNet maximize your revenue with SMS marketing; please visit their www.broadnet.me.